Wondering how long to grill filet mignon? Grilling the perfect filet mignon is easy for any home chef by following a few simple steps. Cut from the tenderloin of the cattle, filet mignon is one of the most tender cuts of beef available. 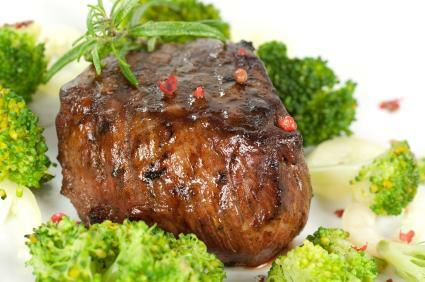 Typical filet mignon steaks are about four to six ounces in size and one to 1-1/2 inches in thickness. For a real treat, try a filet from the tenderloin of American Kobe beef or Japanese Kobe beef from Wagyu cattle. How Long to Grill Filet Mignon? How long to grill filet mignon? It doesn't take long. As a matter of fact, the preparation leading up to grilling and the resting after the grilling usually takes longer than the actual grilling of the meat. Typically, a filet mignon cooked medium rare takes about six minutes per side over high heat. Most people really enjoy the flavor of meat from a high-quality tenderloin. Because of that, the only seasoning necessary for a filet mignon is salt and pepper. Remove your filets from the refrigerator and add fresh cracked pepper (save the salt for the end of cooking because salt can toughen meat). If you want more seasoning, you can add a steak rub. Let the meat rest at room temperature for about 45 minutes. Meanwhile, heat your grill to high heat. When the grill has come up to temperature, place the filets on the hottest part of the grill and allow to sear for five to six minutes without touching or turning the meat. Do not prick the meat, which allows the juices to run out. Instead, use a large grilling spatula or tongs to flip the meat and grill for another six minutes on the other side. Since you want the meat to retain its juices, it is best to measure the temperature of the meat using something other than a meat thermometer. One such method is to use a non-contact infrared thermometer. Another method is called the "touch method," and is described by barbecue master, Steven Raichelen. The touch method involves testing the firmness of the meat by poking it and comparing it to the fleshy part of your hand just below your thumb. For rare (130 to 140 degrees), let your hand hang at your side and poke the area below your thumb. It should have a lot of give. This is how rare meat will feel. It takes about five minutes per side for rare meat. For medium rare (140 to 150 degrees), extend your hand and spread your fingers. Poke the same spot. This is how medium rare meat will feel. It takes about six minutes per side for medium rare. For medium (150 to 160 degrees), make a fist and poke the same spot. The firmness is how rare will feel. It takes about seven minutes per side for medium. It isn't recommended that you cook your filet mignon beyond medium rare, as tenderness and juciness is sacrificed. When the filet has reached its desired doneness, remove from the heat, tent with foil and allow it to rest for 30 minutes in order to allow the juices to absorb back into the meat. After the meat has rested, apply Celtic sea salt to taste, or allow diners to salt their own meat. From start to finish, grilling a filet mignon takes about an hour and a half, with just about twelve of those minutes actually cooking the meat on the grill.